It's the first fully-guaranteed flourocarbon polymer paint protection system specifically for motorcycles and it's made in the UK. Diamondbrite is ideal for anyone who wants to keep their pride and joy in showroom condition, whether buying new or used. 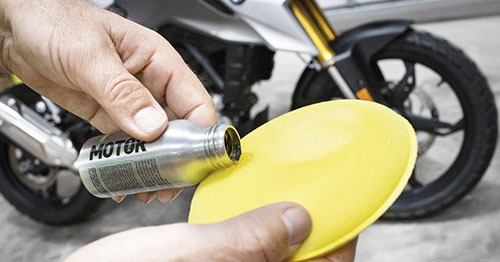 It’s particularly helpful for people who commute on a motorcycle or scooter and anyone who doesn't have an opportunity to wash their bike regularly, but wants to help keep its bodywork in top condition. Can it be applied by anyone? No. Diamondbrite is only sold to the trade and needs to be professionally applied by a trained and approved dealer, in order for the guarantee to be valid. Diamondbrite is a chemical solution that dries to form a tough, high-gloss barrier on painted surfaces, shielding them from pollutants like road grime and 'bug splat' as well as reducing the risk of fading and oxidisation. Does it make washing the bike easier? Yes it does: laboratory testing shows that it reduces the need to wash painted parts by as much as 50% - and you no longer need to worry about washing off contaminants after every ride. What about waxing & polishing? Forget it! 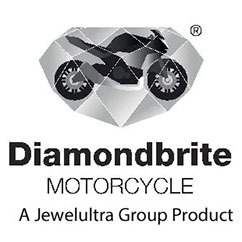 Diamondbrite removes the need for waxing and polishing, since the coating preserves the new-bike shine. Is it covered by a guarantee? 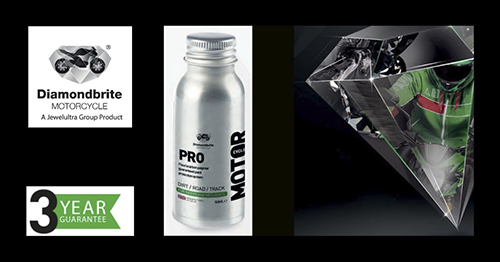 Yes, Diamondbrite Motorcycle Pro is covered by a 3 year guarantee against deterioration to paintwork from etching and discolouration due to loss of gloss, tree sap, insect fluid, bird droppings (must be washed off in 7 days), as well as climaticallyinduced cracking. Watch the video to find out more - CLICK HERE.